CALL’s mission is to raise environmental awareness and promote the sustainable development of urban communities through the arts. Our artist-facilitated programs are conceived to help citizens connect environmental challenges to personal experience and take action to find solutions for concrete improvements. CALL supports interdisciplinary collaborations with scientists, urban planning experts, key community actors, and government officials. support and advance the role of artists in efforts to make cities more livable and sustainable. connect people to the ecosystem and infrastructure that surrounds them, supporting their lives, making things that are hidden, unseen, or abstract real and tangible. CALL/WALKS: CALL identifies artists committed to addressing environmental issues and locates appropriate science or other expert partners to work with them. These collaborative teams engage the public ‘on the street’ in WALKS that raise awareness of the unseen and threatened aspects of their environment. CALL posts videos of the WALKS on its website to reveal the wide array of ideas that are emerging from these public conversations. CALL/WORKSHOPS: Complementing the WALKS are WORKSHOPS, which are designed to facilitate more in-depth conversations between artists and community members. They explore local environmental challenges and create a springboard for arts & design-based projects to generate new ideas and strategies. The WORKSHOPS include 30-40 community representatives and approximately four teams comprised of artists/designers & scientists/experts. CALL/PROPOSALS: Following the WORKSHOPS CALL commission’s PROPOSALS from participating artists/designers to prepare concepts for new PROJECTS. The PROPOSALS lay out the concept scope, goals, science collaborators, intended community partners, site and logistical considerations, implementation timeline and budget. 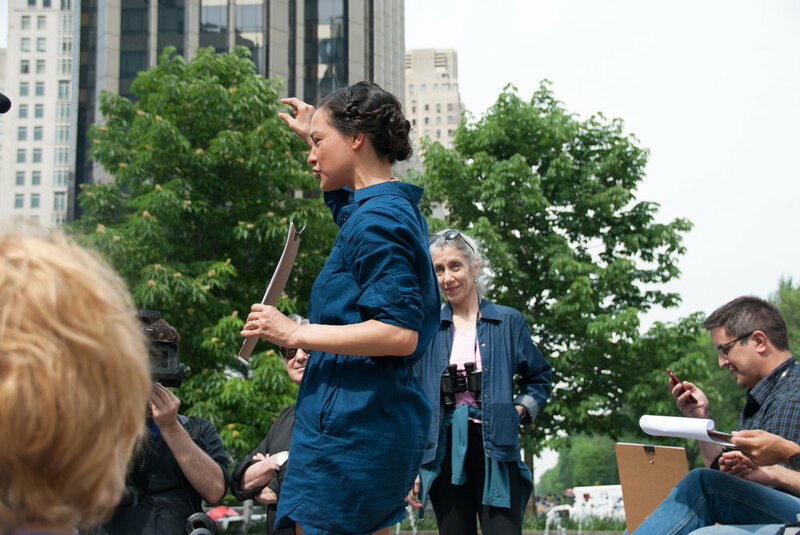 CALL/PROJECTS: In addition to projects commissioned directly, such as WaterMarks, CALL tests and implements the best artist proposals that come from WORKSHOPS. These proposals can be smalls scale community interventions or large scale initiatives that will make a permanent impact on a city.